Winnipeg singer-songwriter Steve Bell is widely known for his prowess on acoustic guitar. But his latest CD, Where The Good Way Lies, has me absolutely blown away by his trumpet playing. It’s hard to believe that the man in his mid-50s claims this instrument has been collecting dust since his high school days. Make no mistake, Bell and a guitar alone are enough to wow an audience. His Juno-winning Year 2000 Simple Songs album testifies to that. Yet one of the charms of his 20th studio album, to be released on November 1, is the rich palette of instrumentation. In addition to the standard keyboard-drum-bass complement, the credits list a smorgasbord of instruments including saxophone, harmonica, flugelhorn, ganjo, mandocello, electric guitar, dobro, French horn and various percussion. Vancouver’s Mr. Accordion, Roy Salmond, even graces one of the tracks. And Bell himself also picks up the ukulele and mandolin. Creating the lush soundscape were a triune team of producers including Bell, longtime partner Dave Zeglinski and Murray Pulver, who also worked on the new Jaylene Johnson project (reviewed last month). Further augmenting the sound are some stunning background vocal arrangements and harmonies. Yet amid the complexity, a few selections have been kept purposefully sparse. That includes the pure-guitar number Freedom Roads, one of two instrumental pieces on the 13-song album. A personal favourite is the title track. Bookended by a traditional Native chant by Co-co Ray Stevenson, the jazzy number features Winnipeg rapper Fresh I.E. offering some indigenous wisdom from “long ago” espousing the seven tenets of courage, humility, honesty, truth, respect, wisdom and love. 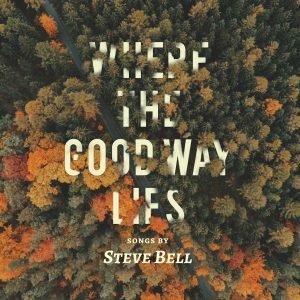 Drawing on sources such as St. Augustine, Robert Louis Stevenson, a local sermon and the Holy Scriptures, in typical Steve Bell fashion, the lyrics offer plenty of precious nuggets that are both thought and heart-provoking. Available on both CD and vinyl, when Bell tours the album this fall, I’m just hoping he doesn’t neglect to blow his own horn.